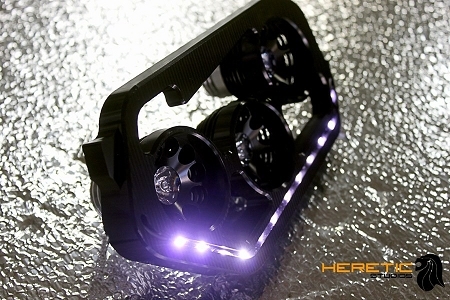 Priced per pair these headlights are 100% bolt in headlights for the Polaris RZR, RZR S and 900xp. 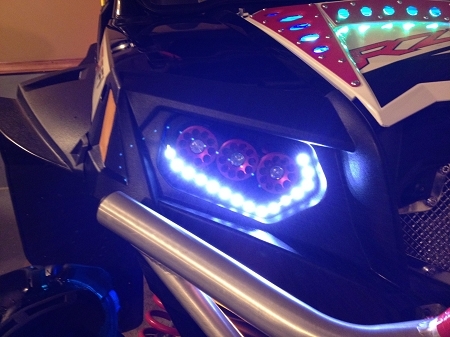 The lights simply bolt in to the location of the stock headlights and versus the standard RZR 650 lumen halogens these lights put out around 4000 lumen per side. The 900 XP OEM headlights put out 1250 and 1600 lumen (High beam) so these even multiply the stock LED headlight output by nearly 4 times. Simply put you are installing a 27 inch LED light bar in your headlights. The LED headlights come with an auxiliary 3 way harness that allows for low and high beam operation all through a weatherproof switch. With three 1270 lumen CREE LED bulbs mated to a proprietary chip driver and an always on daytime running LED strip these LED lights weigh in at under 1lb per side. So on top of being stronger than the OEM lights in the 800 and XP 900 they are also lighter. Boasting an industry leading outer lens that is both scratchproof and 99.7% efficient these lights are truly something special. The faceplate is made from 6061 billet aluminum, then hand sanded and anodized a bright dip black. Each light consists of (3) of our POD single lights each built from a 6061 billet aluminum slab and each LED features our unique chipset pushing a CREE XML LED. Each cylinder features a double o-ring design to keep water out and each chipset is mated to it's billet surrounding by our technicians in Salt Lake City, Utah. 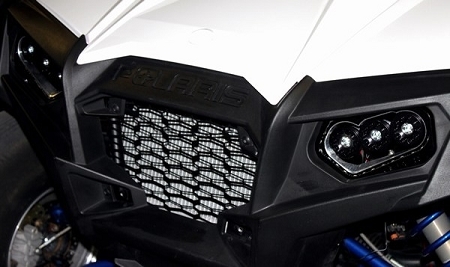 The price is per pair and they work on all year Polaris RZR 800 and 900 models. Black faceplate and black LED lights are the only combinations for color at this point in time. The LED lights burn at around 5k giving off a bright white color. 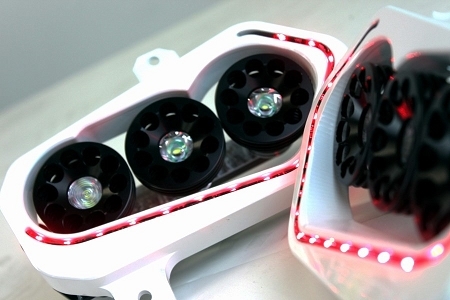 The (3) LED's are mounted to a 6061 billet aluminum baseplate that attaches itself to a swivel mount on the back of the faceplate. The whole light assembly is hard mounted to the RZR on the actual faceplate so there are no additional mounts required to install them. The base offering features a 10 inch LED halo, single mode off/on option and customers choice of reflector configuration. 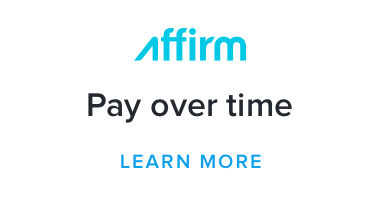 A high and low beam option is available for an extra $75.00. Customer configures each bulb with either a spot or flood reflector and each light is completely rebuildable and reconfigurable. Expect up to 5 business days for the headlights to be assembled. These are the brightest. Best looking lights out there. I get comments on them alk the time great purchase. Q: hello sir i want instructions in choosing the colours for this ite, i don't understand what is the bezel and cylinder and carbon overlay i want to know which colours im choosing thx ?